I am making Elise Campbell's "Love Knows No Season" from 2010. I have patterns, no directions. Two of the blocks have vine tendrils and I can not find how to make them. They are very thin and I can hand applique them...if I only knew how to make them. A bias maker, 1/4" is too wide. You can just embroider them. Use a 1/2 inch bias maker. Starch the resulting band heavily as it is coming out of the maker iron to dry crisp. Then cut the bias tape right down the middle. Take one half and sew the folded edge on your placement line. After sewn down, lift up the raw edges and trim with sharp small scissors the lower raw edge. The one lying toward the background. Now simply needle turn the top raw edge and sew down with small appliqué stitches. There you have it. Yep, I do that with stems and slightly curved vines, it's the loopy (2 or 3) that I can't figure how to do. Seems the tiny vine would have to be finished then forced into the loops. I can't seem to get the fine thin enough to curl. I don't know of this pattern, sounds very intense though. If no one here has it and can get it to you, if it were me, I would just wing it....improvise, who's to know! We will never tell! I have a similar book, and the author did reverse applique for thin vines and embroidery for very thin tendrils. Or you can couch them. Dunster, thank you for sharing Yoko’s video...she is amazing. Thanks, Dunster, for the link - I learned something! Then try Hungarian Braided Chain Stitch. Works up lovely. You will have to look it up for directions. Good luck. Perhaps I'm not following Quiltlove.....I take the bias strip, fold in half, machine sew the raw edge slightly to the left of the vine line drawn on the quilt, then fold the bias vine over the line to the right and hand stitch the folded side down.....no turning of raw edge, you have it already, with the fold on your hand stitching side of the vine. Hope that makes sense. Dunster, thanks for the link that was fascinating to watch. I love everything Yoko does. She is amazing. Jacqueck, you can make your own bias strips if you want to, it is really quite easy. I have made them as skinny as 1/10" using heat resistant wire ties or Karen Kay Buckley's Perfect Stems (which are nothing more than heat resistant wire ties!). Any auto parts store and possibly Harbor Freight would have them and for a lot less $ than Karen charges for her set. Here is a link to a you tube video on how she makes them. I don't have any bias strip makers as I find making bias strips is a very easy process. I watched it too, but I am not coordinated enough to do it her way. I do start out the way she does by stitching down the the folded over bias piece with a small stitch length, and stitching as near to the folded edge as I need to be for my width. I trim the seam allowance as close to the stitching as I can without making it too thin to hold secure. Next, I fold the bias over the previous stitching and (hand or machine) sew it down depending if it needs durability for a child’s quilt or invisible hand stitches for for show quality. I have also tried Karen Kay Buckley’s method, but to me it was an extra step, and my method is sewn down as it sewed. My method (grandma showed it to me) also makes the width to be whatever size you need, and no limits based on the size tool used. Last edited by madamekelly; 05-25-2018 at 10:12 AM. Cut a 3/4" strip on the bias. Fold and press in half. Position and sew about 1/8" along raw edge. Fold remaining fabric over seam line. Machine or hand stitch. Perfect vines. I'd just couch some rattail or something similar on for the stems. Ladies, I think some of you are missing the point. The OP says she knows how to make a bias stem/vine. What she can't figure out is how to make it go in a loop, where the vine crosses over itself. Have you tried doing it in two steps? Sew down your vine only up to the point where the loop starts, (the blue section of my picture,) leaving the rest of the vine fabric unsewn. Finish that section. Then do the loop over itself. Two of the blocks have vine tendrils and I can not find how to make them. They are very thin and I can hand applique them...if I only knew how to make them. A bias maker, 1/4" is too wide. Are we reading the same post? She clearly states "If I only knew how to make them". I agree with Dunster, Yoko Saito makes beautiful stems. I've done it both ways - bias tape maker and Yoko's method. I find Yoko's method is much easier, faster, and I get a much skinnier vine. I adapted her method a bit, I sew the first side of the stem on my machine, then fold it over and sew by hand. Last edited by Peckish; 05-25-2018 at 02:19 PM. Yep, I do that [technique] with stems and slightly curved vines, it's the loopy (2 or 3) that I can't figure how to do. Seems the tiny vine would have to be finished then forced into the loops. I can't seem to get the fine thin enough to curl. Jacqueck - if it helps, you can cut the bias strip where it crosses under itself. Can you fold bias strips that you make? Plenty of videos on line for making strips from square of fabric. Then follow direction I sent earlier. 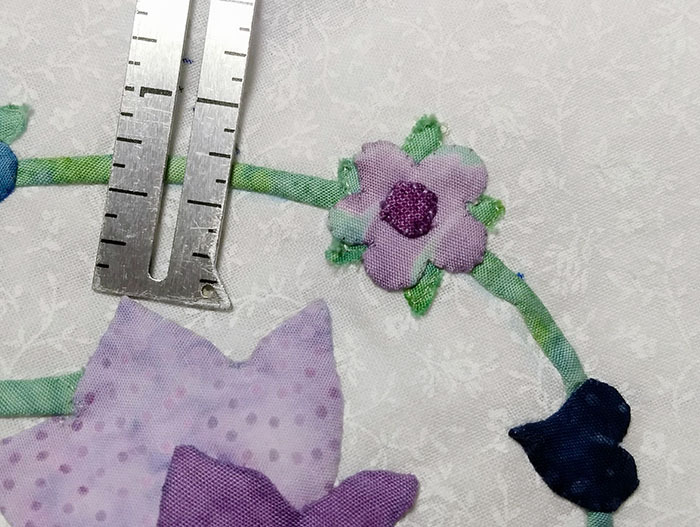 The width of the bias should be double what you want for finished stem because you will fold the bias strip in half, place slight to the left of the drawn vine line, sew by machine, turn the stem over to the right, covering the drawn line and hand sew.